Cam's Cinematic Episodes: Film Review: James Bond Returns In A ROYALE Without Cheese?! Film Review: James Bond Returns In A ROYALE Without Cheese?! Every Bond fan has their ideal image of what 007 should be. The majority of fans hold true to the standard set by Sean Connery in classics such as Goldfinger and From Russia with Love. Others are partial to Pierce Brosnan’s slick and playful approach in the most recent additions. There is even a small collective who are loyal to the grim humorlessness of Timothy Dalton. Personally, I fall into the group that swears by the wonderfully light touch of Roger Moore. I strongly believe that the Bond each fan embraces is the one in which they are initially exposed to. I vividly recall my introduction to the beloved franchise, at around 8 years old, when my parents showed me Roger Moore’s final entry, A View to a Kill. 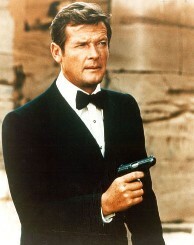 Whereas some fans were imprinted with classic moments such as the gold-painted woman in Goldfinger, or the volcano layer of Ernst Stavro Blofeld in You Only Live Twice, my first introduction to Bond was witnessing him sno wboard around a team of armed adversaries to the tune of the Beach Boys' California Girls. What can I say; I was a child of the eighties. Now, while I consider Moore’s greatest entries like The Spy Who Loved Me or Live and Let Die to be my personal favorites, I have a great fondness for every film in the franchise. Even The Living Daylights. So, with joyful anticipation, I took to my front row seat, opening night at the Park & Tilford Cineplex Odeon theatre, to witness James Bond's latest adventure, Casino Royale, unfold. Casino Royale doesn’t just feature a new Bond, this time played by Liverpool actor Daniel Craig, but it is also a complete overhaul of the entire series. Gone are the days of diabolical millionaires attempting to start World War III, or cr eate a new world order. Also, nowhere to be seen are the campy thrills or hokey humor which had become a staple of the franchise. Most importantly, this isn’t the Bond I recall meeting near twenty years ago! He’s arrogant, un-subtle, and vicious… Not to mention… Human?! Royale tells the story of James Bond’s first case as an agent of M16. After a wonderful black-and-white introduction detailing Bond’s achievement of his double-O rank, we join him as he is investigating a series of seemingly related terrorist events. As usual, it’s not long before his surveillance attempts transform into all-out orgies of stylized violence. Soon, 007 is on the trail of a desperate and sadistic terrorist banker named Le Chiffre, played by Danish actor Mads Mikkelsen. It seems Le Chiffre has been playing the stock market with his terrorist clients’ money and is in serious financial trouble. Aiming to regain his lost currency, he is planning on taking part in a high stakes game of poker at the titular Casino Royale. 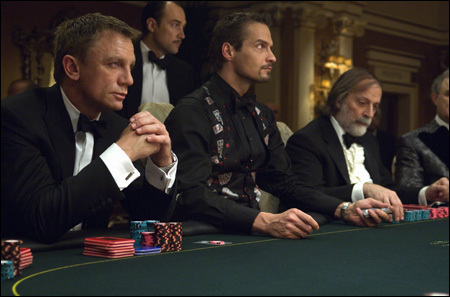 Bond, being the best player in the service, is sent to beat Le Chiffre and leave him bankrupt, allowing the British government to get their ha nds on him as a source of information. Bond is accompanied on his mission by a treasury agent named Vesper Lynd (Eva Green), who is on hand to approve and bankroll his efforts. What happens during and after the game I’ll leave for you to discover, but will say that it is like nothing you’ve seen in the previous twenty films of the series. Viewing Casino Royale is like entering the Bond universe anew. Whereas, the earler films all followed a fairly rigid pattern, Royale is a confident step in a different direction. A good part of the reason for this is in the casting of Daniel Craig. Craig lacks the polished demeanor of Moore, as well as the sl yness of Sean Connery. Instead, he’s rough-edged and overly confident, a smart brawler who hasn’t yet realized the strength of playing it cool. We see him bleed and suffer on his way to becoming the man he will one day be. Namely, the sophisticated agent we first met in 1962’s Dr. No. At first it’s strange seeing Bond behave this way, but due to Craig’s electric performance, it quickly becomes hypnotic. It’s quite apparent the he is likely the most versatile actor ever to throw on the famous tuxedo. Whether engaged in furious action scenes, or tackling the film’s quieter romantic moments, Craig never falters. His performance is almost fearless in his dedication to the role, and he inhabits it within seconds of his trial run. It’s important to remember that this is the first time that Bond has had a real character arc, and it’s thrilling to watch Bond played outside of the usual comfort zone. In one film alone, Craig ascends to the upper echelon of Bond actors. Speaking of having chemistry, Eva Green’s character doesn’t quite match the mold of any Bond gir l who has come before her. She’s intelligent, beautiful and independent, and is Bond’s true equal. The verbal sparring between Craig and Green is a joy to behold, and bring a real underlying romance to the film. Her character is the key factor in causing Bond to become the man we all know, and Green (pictured) is the right actress make it believable. She’s able to communicate some of the film's most powerful moments wordlessly, and sets a new standard for all future Bond girls. By not being written as the proto-typical bombshell, she becomes a fascinating character in her own right. The supporting cast is equally strong. 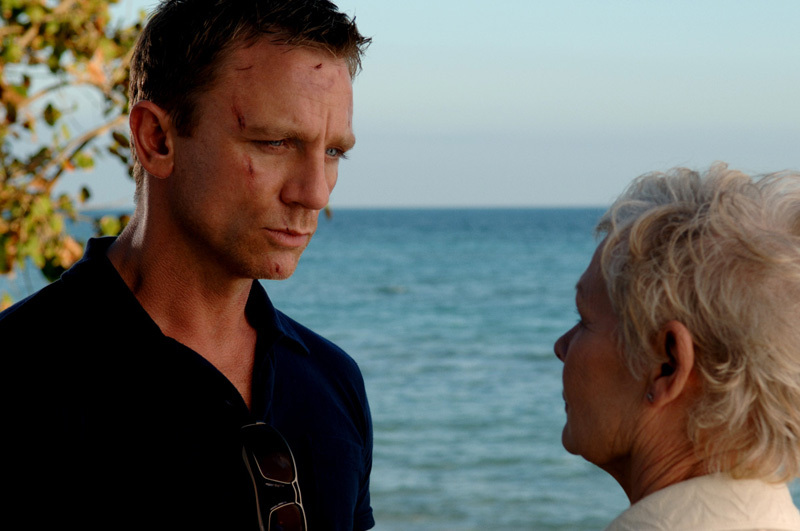 Judi Dench, the only holdover from the previous films, is characteristically brilliant. Her portrayal of M is different this time, however. She’s irritated by Bond's ego and recklessness, but still senses serious potential in the inexperienced assassin. Dench’s scenes here are her best of the series. Jeffrey Wright’s scenes as Bond regular CIA agent Felix Leiter are also very strong. His first meeting with Bond is perfect at setting up the relationship we know will follow. While his screen time is brief, it leaves us eager for his likely reappearance in Bond 22. Also a great asset is Giancarlo Giannini as Bond’s contact Mathis. His world-weary spy is a vividly drawn character, and not simple window dressing. It’s great to see even the minor supporting characters so perfectly realized. Director Martin Campbell has somehow managed to replicate the success he had with Brosnan’s inaugural 007 film, GoldenEye. He steers the film from a perfect opening to a crowd pleasing close, really underscoring the mythic elements of the character. It’s a true testament to his skill that the film’s poker showdowns are as absorbing as the action scenes, including the stunning chase scene between Bond and “freerunning” superstar Sebastien Foucan. Campbell has recreated an entire world here and I hope he sticks around for future installments. Leaving the theatre, I was energized by what I had just seen. True, this isn’t the Bond who once deactivated a nuclear bomb in a clown suit, but with Craig we have a 007 who seems new and exciting. It’s rare that a long-running franchise is able to completely reinvent itself and remain true to its origins. With Casino Royale, however, we have a Bond that has us thrilled for the next twenty one films. Nobody does it better, indeed. Goldfinger! He's the man... the man with the midas' touch. A spiders tough.